Gospel music has had immeasurable impact on the African American church and on the sound and performance of American popular music. As we look forward to gospel’s new frontiers—international gospel choirs and conferences, nationally televised competitions, and proliferation on radio and digital media—it is also prudent to look back and remember, reflect, and record the history of this important cultural expression. 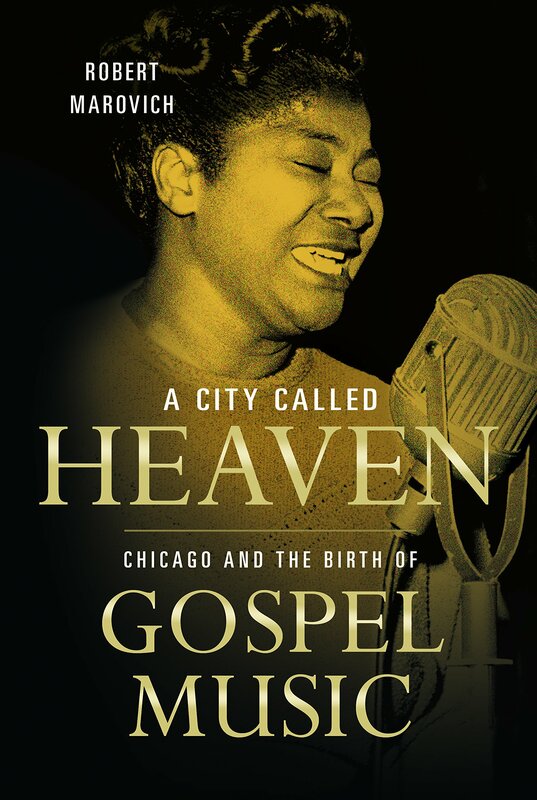 In his monumental text, A City Called Heaven: Chicago and the Birth of Gospel Music, gospel music historian and radio personality Robert Marovich explores one of the most important and contested discussions on gospel music—its origins. Using extensive interviews, archival research including materials at Archives of African American Music and Culture (AAAMC), articles from the Chicago Defender, and numerous secondary sources, he outlines why Chicago, Illinois is THE uncontested birthplace of gospel music. Moreover, he highlights the major artists and musicians, churches, choirs, quartets, publishers, radio and television broadcasts, and record labels that were instrumental in the development and dissemination of this art form. A City Called Heaven is divided into two sections: “Roots” which spans from the 1920s to the late 1930s, and “Branches” which examines gospel’s evolution from the 1940s to 1970. In a candid, yet straightforward tone, Marovich crafts a narrative about this Christian community of musicians who would transform their ordinary circumstances into an extraordinary expression of faith. The substance of the text rests on five main arguments: 1) Gospel music was a means for African American migrants to establish their place within Chicago’s African American church and social communities because it allowed them to combine their southern worship styles with urban musics and sensibilities; 2) Gospel music transcended denominational boundaries while also being influenced by unique denominational styles; 3) The gospel music industry was birthed from the entrepreneurial ingenuity of often fiscally oppressed African American migrants; 4) Gospel music would be periodically altered by younger artists; and 5) There were six historic “tipping points” or events that helped establish gospel music including Thomas A. Dorsey’s founding of the first modern gospel chorus at Ebenezer Baptist church and the founding of (Sallie) Martin & (Kenneth) Morris Music Studio, the largest African American owned gospel publishing enterprise. Perhaps the greatest strength of this work is the sheer breadth of information that is presented. Great care is given to move beyond simple biographical sketches of more well-known innovators like Dorsey, Mahalia Jackson, Theodore Frye, Roberta Martin and Sallie Martin to ground the story in the sights, sounds, language and community of Black Chicago. Marovich gives ample space to the distinctive worship styles and contributions of clergy and churches that performed and transformed gospel music like Pilgrim Baptist Church, First Church of Deliverance, Fellowship Missionary Baptist Church, and the Cosmopolitan Church of Prayer. Likewise, the stories of many of lesser known artists like Magnolia N. Lewis Butts (whose work helped the National Convention of Gospel Choirs and Chorus become a mobilizing force for gospel music industry) are celebrated. Marovich’s extensive background in traditional gospel recordings is particularly suited to this text as he offers specific evidence (and educational speculation) for the musical innovations and influence of gospel artists like Mahalia Jackson, Sam Cooke, and the Highway QCs. Marovich passionately supports his main arguments as he illustrates how Chicago became the first gospel center and an integral part of a national network of gospel communities. Because of the large number of singers, groups, and recordings that are mentioned, certain discussions are rather encyclopedic. Undoubtedly, a lack of available resources and space limitations necessitated that some histories be abbreviated in the text. Nevertheless, A City Called Heaven is a valuable resource that points to the many voices that were important to the success of gospel music. With his text, Marovich extends an invitation to readers and gospel music lovers to celebrate the beautiful and spirit-filled contributions of those who paved the gospel highway from Chicago to heaven and back. Bob Marovich has partnered with the AAAMC to digitize and preserve the audiotapes of interviews conducted for this book. The original tapes and transcripts will become a permanent part of the Robert Marovich Collection available at the AAAMC.